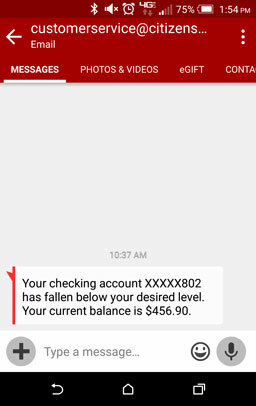 You can receive Account Alerts for your checking and savings accounts each time there is a deposit or withdrawal. You can also set up a low balance alert to notify you when your balance falls below a certain threshold. Account Alerts can be sent to an email address or sent as an SMS to a mobile phone. These alerts can be setup by selecting the account you wish to monitor through Online Banking or by contacting Customer Service. You do not need to be an Online Banking user to receive alerts.